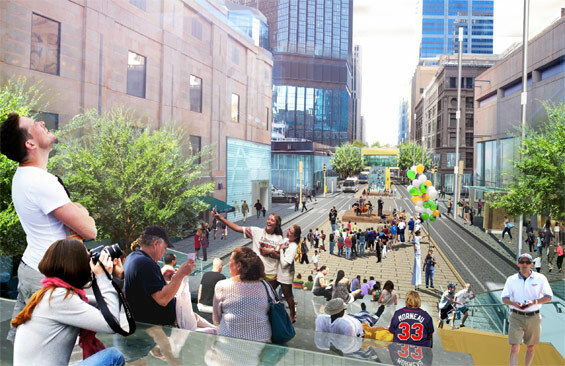 James Corner Field Operations won the commission to redesign Nicollet Mall, a beloved but aging pedestrian and transit corridor in downtown Minneapolis. 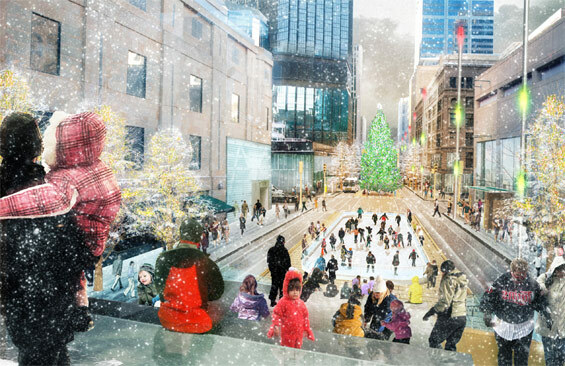 Today, Nicollet Mall is in dire need of a physical retrofit and upgrade. It is also part of a larger vision to ensure the growing vitality of downtown Minneapolis and is an important component for Minneapolis to maintain a competitive edge as a place that attracts investment and a place that people want to live, work and play. 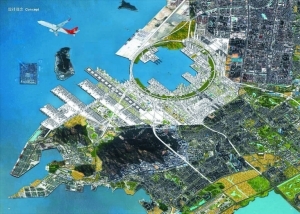 The new design retains the signature and defining curved street from Lawrence Halprin’s vision while re-calibrating the Mall toward even greater social and pedestrian ends. 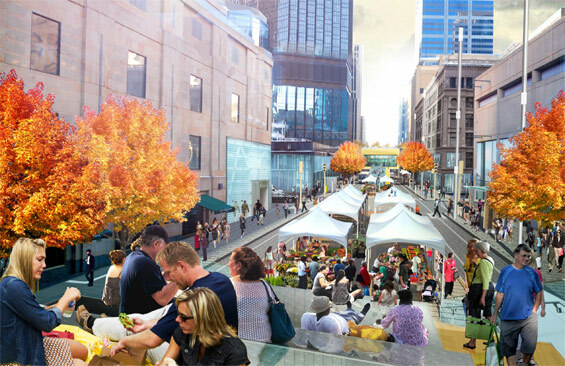 The result is Nicollet Mile – a downtown destination, an attractive place to walk and experience the City, an economic engine and an important link connecting various institutions and communities together. 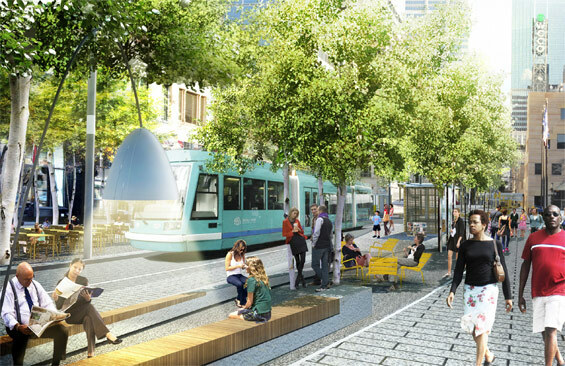 We imagine Nicollet Mile as a more inviting, eventful and social destination; a curated promenade of experiences and attractions; a greener and more sociable corridor; a ribbon of light; an elegant urban spine of inter-connectivity, movement and delight. Grouped groves of trees provide movable seating and a strong sense of green nature, functioning also as porous storm-water collection areas. 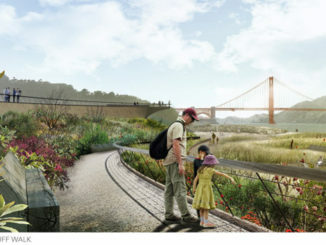 This strategy allows for the creation of generous plantings that can work flexibly and interchangeably with sub-grade utilities, essentially working around them. The groves provide significant greenery and seasonality without incurring the congestion of planters and edges. Species are native to Minnesota and add biodiversity to the corridor. 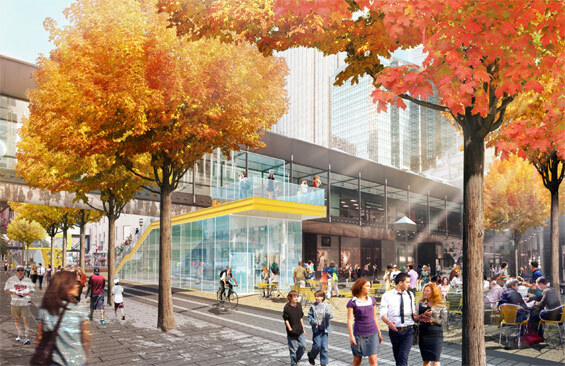 The ‘Island’ transforms 7th and Nicollet into a new town center for downtown Minneapolis. 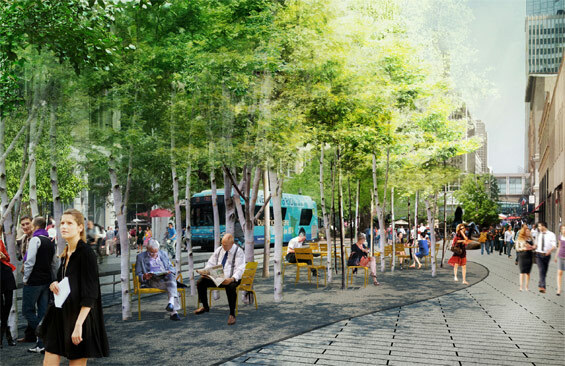 This is the most urban and intense area, where we envision Nicollet serving as the main linear plaza along which people traverse and come together. Two large-scale seating steps define the central space and connect to the existing skyway system to draw people down to the street level. At the Island, in the heart of downtown, we create a central median as a place where people can gather and participate in a variety of informal and programmed events, festivals, performances and markets. Two bold stairways paired with skyway balconies and frames allow for a stronger visual and physical connection to and from the street and are strongly color coded to signal their function as public access points. 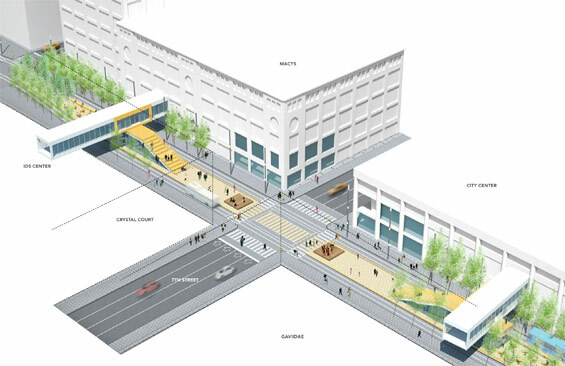 The ‘Island’ is strategically located at 7th and Nicollet – where the skyways come together in a loop and where new property owners are proposing significant investment to activate the street. The underside of the new stairways can also accommodate an enclosed space for a small restaurant, café, information kiosk, or other amenity. As part of the redesign project, the sidewalks along Nicollet Mile will be prioritized and widened. New transit shelters and kiosks bring activity to the street and ensure the continued use of buses and future use of streetcars. A ‘Reading Room’ between 12th and 11th Streets defined by a curvilinear bench is equipped with wifi, book exchange, charging stations and a over-scaled reading lamp where people can wait to catch a bus or streetcar or eat their lunch. 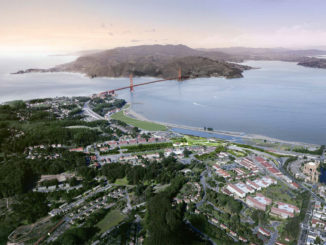 with Coen + Partners (Landscape Architecture), Snow Kreilich Architects (Architecture) and Nelson/Nygaard (Transportation Planning) and SRF Engineers (Civil, Structural and MEP Engineering).